EVER since the ownership of software firm Mphasis changed hands first to EDS, and then to global giant Hewlett-Packard its sales have doubled in three years while the net profit trebled. The company, which has an assured one-third revenue from parent HP, yet rides a price-earnings multiple of 13 that stacks up against an industry average of 22, a reason for investors to take a fresh look at Mphasis when they rejig their portfolios. The Bangalore-based firm recently acquired AIGSS, the captive back-office arm of AIG, which adds insurance into Mphasis mainstay software development and maintenance services. Infrastructure management, customer services, technical helpdesk, and transaction processing services are some of the other verticals that the company derives its revenues from. The AIGSS acquisition is expected to double Mphasiss revenue from banking and financial services business. Among markets, the US accounts for 66% of its total revenue while Europe brings in 20% and Asia Pacific and West Asia together contribute the rest. Verticals including banking and financial services, technology and telecom contribute threefourth of the total revenue. In recent quarters, it has witnessed growth in other segments including logistics, healthcare and pharma. Offshoring revenue accounts for three-out-of every four rupees of Mphasiss total sales. Its share of offshoring is quite high when compared to some of the top IT exporters who earn about half of their revenues from offshoring, which commands relatively higher operating margins. The NYSE-listed Electronic Data Systems Corporation had acquired management control of Mphasis in June 06. EDS in turn merged with HP in May 08, and currently owns a little over 60% stake in Mphasis. The HP-EDS combination has so far proven to be effective for Mphasis as its revenue has grown significantly post the merger backed by robust expansion in profitability. Its revenue in the July 09 quarter surged to Rs 1105.6 crore from Rs 688 crore a year ago. Net profit more than trebled to Rs 229.2 crore by similar comparison. The company currently sources 32% of its revenue through the HP and EDS and this is expected to grow in future. 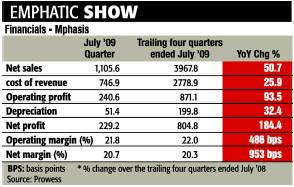 Mphasis has seen a gradual improvement in profit margins post HP-EDS deal. In the July 09 quarter, its operating margin expanded to 21.6% from 17% a year ago. It has also increased its efficiency of collecting outstanding sales. Its sales outstanding reduced to 75 days from 78 days a year ago. At the current level of Rs 517, the stock is traded at a trailing twelve month P/E multiple of 13. The valuation is lower when compared to the P/E range of 18-22 for other bigger IT companies. Moreover, this does not take into account the accretion in the bottomline once the financials of AIGSS are consolidated with Mphasis. Given its future prospects, investors can consider the stock of Mphasis with a horizon of two years.